I recently acquired access to a shocking video from Egypt that shows a Muslim mob attacking a Christian Coptic church, setting cars on fire and then toppling a Cross atop the steeple. I thought this would make a real life illustration in the Scripture above from 2 Timothy 3:12. Although I encourage you to watch the video in its entirety, I must warn you that it could become quite convicting, that our Egyptian Christian Brethren are experiencing, right now a shocking attack against Christians that is being played out at least 23 times since the crisis erupted in Egypt. The video was obtained by ‘Mid-East Christian News’, and was shot August 14, 2013 from a nearby building that overlooks the church in a southern city called, Sohag. The video is six minutes long, and shows a crowd of ‘Pro-Morsi’ supporters massing outside the church. You will see several members of the group scaling a wall, attacking vehicles in a courtyard, setting them on fire. The culmination is a man who reaches the crown of the church who begins to tear down a Cross. Please, take the time to view it before you read this blog. 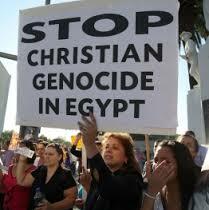 Christians in this region make up for approximately 10% of the population of Egypt. With the recent upheaval of a ‘Muslim Brotherhood’ aligned government, Christians have been more on the attack, as the ‘Muslim Brotherhood’ seems to have a reputation to destroy anything, anyone, by threats of violence and death. I’m reminded by the verse where Jesus say’s that the the “thief cometh not, but for to steal, and to kill, and to destroy: I am come that they might have life, and that they might have it more abundantly”. John 10:10. It seems that as World events become reality in what the Bible teaches about end times prophecy. Although there is much to talk about and compare Scripture to, this is not directly what I want to share today. It seems that so much of the church today, especially here in the United States are doing, in regard to World News, is to read it, ‘discuss’ it, and leave the conversation with anger and frustration, with feelings of hopelessness , without getting involved. I believe that God wants us to get involved! For some, it could be waving a sign, marching in protest, writing letters to our elected officials, to others it means arguing which side to take in a political issue. I believe in a similar way we, as Christians have a moral responsibility to also “get involved” along side our worldly responsibility of voting. We do so by after hearing of a report like the one we’re talking about today, and after seeing the video above to make our voice matter. We can do so by a most powerful weapon called prayer. This is the same Jesus who forgives us of all our sins, and has radically changed the attitudes and former deeds of thousands and thousands of people. In closing, we all have not just an obligation, but a responsibility to pray for all the members of our family in Egypt, Iran, and all these places in the Middle East where Satan has taken a stand to decieve the world into believing that Christians don’t matter. We know the truth of the matter because “He that is in us is greater than he that is in the world.” We know this verse well enough, but think about it, if He, Jesus is greater, why don’t we turn to Him and ask Him to intervene on behalf of our Brothers and Sisters in Christ? It’s right time for us to ‘walk the walk, and talk the talk directly to Jesus Himself. It all starts with a thought, and a thought developing into a 2 or 3 minute action in prayer.